The Multiface is not only multi because of the many different interface formats supported, but also multi-channel! The small box using half the space of a 19" rack includes outstanding power and extensive features. 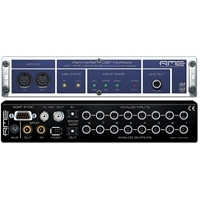 Based on RME's award-winning Hammerfall technology the Multiface offers ADAT optical I/O, ADAT-Sync In, SPDIF I/O, MIDI I/O, word clock I/O and a separate analog line output. On top we provide 8 analog inputs and outputs, balanced and 96 kHz/24 bit, of course. All this can be used on laptops as well as on desktop computers with 'zero cpu load' and low latency! The rear of the Multiface shows unrivalled connectivity: 8 analog line I/Os on 1/4" TRS jacks (balanced, 24 bit/96 kHz), ADAT optical I/O (switchable to SPDIF optical), ADAT-Sync In, SPDIF I/O coaxial, word clock I/O and MIDI I/O. Don't settle for less! The Multiface can be used with laptops as well as desktop computers. The connection to notebooks is achieved via a CardBus card, the connection to desktops via a PCI card. These interfaces are sold separately.